BIG CONGRATULATIONS TO ORKANENS OOPS THE OUTLAW AND OSSIAN MODIN TO TOP 10 IN IPO WORLD CHAMPIONSHIPS!!!!!!!!! Ann and Quax won another competition!! Congratulations to Ossian and Orkanens Oops the Outlaw, competed today in IPOIII with the result 97-97-96 290 points and a ticket to the world championships. They also became Swedish working class champions in IPO !! 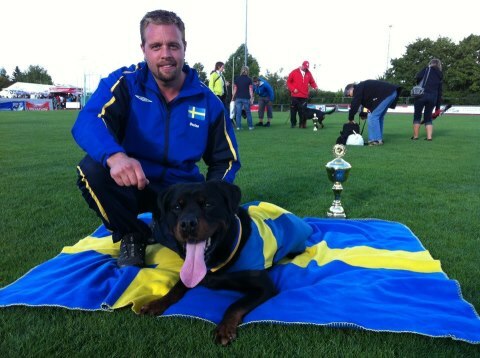 Congatulations to Ossian and Orkanens Oops The Outlaw for winning the Swedish Rottweiler IPO championship!! For the second time ! !